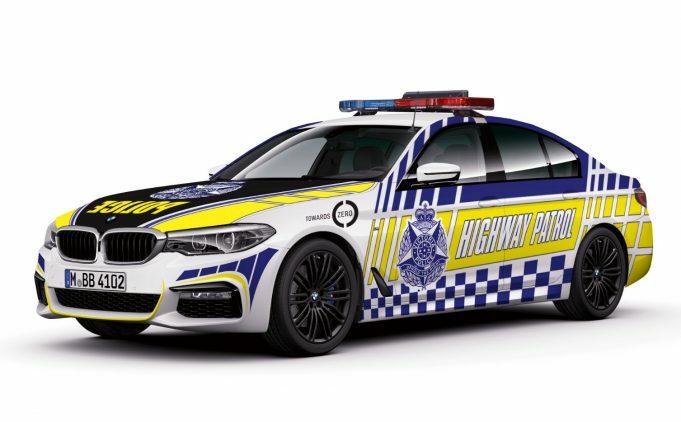 IF you plan to try and get away from the constabulary in Victoria, you better think again, with BMW set to supply as many as 80 special edition 2018 530d sedans to the Victorian Police for use as highway patrol cars. The arrangement sees Victoria Police committing to stock up its fleet by the end of next year with the new turbo charged performance diesel, following in the footsteps of a multitude of European police forces, in using the vehicle for heavy duty operations. “Lauded by media and customers alike for its combination of performance, safety and efficiency, the new BMW 5 Series range is a natural fit for police duty,” BMW Group Australia CEO Marc Werner said. The vehicles will be supplied in an entry-level specification, eschewing some of the higher-end luxuries found on the regular production model in favour of a factory-fitted ‘police pack’. In its road going version, the 530d is aimed squarely at business executives, and features such things as adaptive LED headlights and daytime running lights, and enhanced Bluetooth with wireless charging. Despite its reputation as a luxurious sedan, and even which much of those luxury comforts removed so it can perform best as a police vehicle, it is renowned for its rear leg room; a plus given its new role. The first BMW 530d Victoria Police Highway Patrol vehicles are expected to be operational by early-2018. CAPABLE of sprinting from 0-100km/h in just 3.9 seconds and punching out some 467kW of power and 900Nm of torque, the new Bentley Bentayga Speed is the world's fastest production SUV.